When the brass prompts the breath, the soprano-saxophone runs the betting with the sperms, the vietnamese monochord streams with the blood as an erythrocyte, when the voice intones the "aria of the larynx", the bassclarinets battles against cancer cells and the accordion performs a dance with the menière disease, then you are placed in the 3-d-surround sound of the live-performance: opsonization. Which literally means to mark a strange invader f.ex. in the blood stream for the macrophages, to be better found and be eradicated by them. In the show there are different lavels and stories, made possible by modern techniques for the visualization and auditive modification. The main story is about different conditions of health (like the digestation or respiration) as well as sick conditions (such as the menière disease). The main side storie is about the emergence of human life, in another side-story in the blacks (to recover) two abdomen aortas fall in love. With their reproduction the artists have created an "art-virus", which will be released near the end of the show, so the audience will be "contanimated and contaminated" by it! The performance takes place in a dark room with three transparent screens and a "nucleus" in the middle, under which there are some places to lie. Here you might lose space and time completely, for all the recordings are based on the cardiac rhythm of Ingeborg Poffet (who is as well naturopath), so it's possible to develop prenatal emotions! The rest of the audience is placed in a circle as "cell membrane" with a better visual impression of the entire happening. Afterwards there will be enough time to recover, to process the experience and to gather again with a drink. episodes from different conditions of the body, partly healthy (physiological) and partly with pathological changes. More over that the biggest wonder in the universe, the genesis of life, is told. All can be (modified) shown through modern technics. Also a tiny side-story is there, a love-story of the abdomen, shown in the blacks between the scenes, two aortas fall in love together. Only their reproduction is used as base for the art-virus in the scene 17 of contanimation, so the audience is witness of the production and the outspread of an art-virus (that's why it is cont-animated while being contaminated). The acoustic base of opsonization is the heartbeat of Ingeborg Poffet, recorded with double-sonographics by Dr. med. 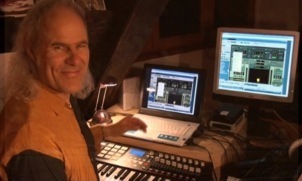 Daniel Müller, which have been electronically modified by JOPO. 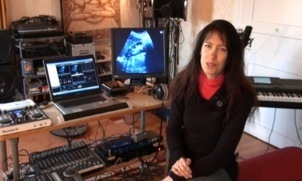 Also the visuals are made of the recordings with sonographic (by Dr. med. Daniel Müller) as well as x-rays, computer-tomography, magnet-resonance-tomography, laryngoscopes, cuts of histology and animations, modified and animated by JOPO & Ingeborg Poffet. 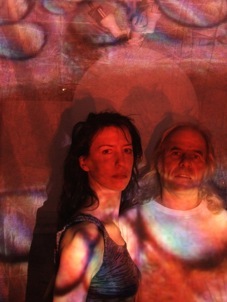 Again JOPO & Ingeborg Poffet create a "music-video-Art-project", which leads even more into spheres of the unconcious experiences as the formally projects out of 21 years of common work. The project is based on origianl medical recordings, such as sonography and doubled-sonography, which are electronically modified, both visually and audi-tracks. They put own compositions for horn, bassclarinet, accordion, voice and the vietnamese dan bàu on top of the electronics of heart-beat-modifications and realize subtile transformation. The fascination "human body" is confrontated with "technical possibilities". Nature and technics combine as a unique or as components that exclude each other. Three beamers with different projections-screens and the sounds dive the room into a surreal conglomerate of divers impressions and prenatal experiences. To live with technics and nature, does it work together or against it? to mark a cell as “strange, to delete” for the macrophages. In “opsonization” there are just original medical recordings of sonographies, angiographies and others being used as basic for sound and visuals. Opsonization is a mechanism of the immunsystem of higher living beings. During the opsonization the surface of strange cellulars or strange beings, that have entered the body, will be covered with antibodies and factors of the complement-system (C1-9), detected because of their design of antigenes. That's why the foreign cells can be discovered and eaten by the phagocytes. The numerous antibodies on the surface of the foreign body help to proceed the phagocytosis, wherein the foreign bodies are eaten up and dissolve. Receptors on the surface of the cellular membrane of the phagocytes dock to the antibodies and bring more receptors near the foreign cellular membrane, which is soon completely covered by the phagocytes. Also we track down musically motives, mark and loop them, assimilate, work through and dissolve them (the musically phagozytosis). 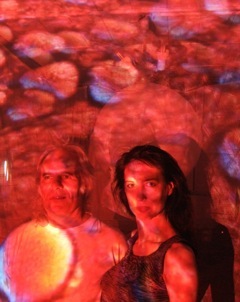 We work with sounds like the audio-double-sonographie, which we use as base for the music-concept, acoustically isntruments llike saxophone, bass-trombone, accordion, voice, dan bàu and electronics, computers and sampler. We lure to certain expections which take unexpeted exits. Visually these ways are supported by travels into cellular structures and regions.